Georgia vital records are available for $25 plus $5 each for additional copies. Georgia birth records have been stored centrally since January 1919. Before that, they were stored in the county where the birth occurred. Georgia death records have been on file in Atlanta since January 1990. Before that, they were located in the county where the person died. In either case, the fee is payable by certified check or money order to the Georgia Department of Public Health, though individual counties have their own policies for payment. To obtain a Georgia birth record or death record, one must be the person on the record, the legal guardian of that person, or an immediate relative thereof, including grandparents but excluding aunts and uncles. 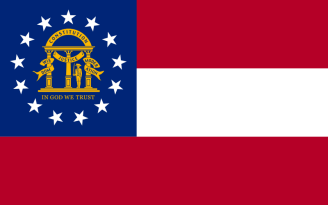 Georgia was one of the original colonies of the United States. At first, it included the area that is now Mississippi and Alabama. Note: Request forms may be printed from the web page. To locate natural parents contact the State Adoption Unit at 404- 657-3550, or for information concerning sealed records contact the Legal Unit of Vital Records at 404-679-4702. Record Access Requirements: For investigative purposes or distant relatives, a signed release from person of record is required. Search Note: Email questions to phvitalrecords@gdph.state.ga.us. Note: A request form may be downloaded from the web page. Record Access Requirements: Death certificates are available to the general public. Cause of death is released to next of kin only. Note: Email questions to phvitalrecords@gdph.state.ga.us.